Billy Kay launches Bella’s Scots language stream. Staunin on a gey shoogly floatin map o Scotland, I aince shoutit thir words at a camera for a Channel Fower Schuils’ series on the Scots leid – ma furst an anely mither tongue, as it wes the ane leirit at ma mither’s knee. Nae need tae shout at wice bodies like you that cleik on the Bella Caledonia wabsteid ye micht say, an ye micht be richt! Sae I’ll propone tae ye as doucely as I can, sae that ye tak tent o whit we’re efter. Here gaes….“Hey you – pyntie-heid the baws, Scots deniers an naesayers, cringe-yokit monoglot English hauders oan, Gaelic supremacists an Lallans leidbangers, scrievers wha whiles spairge their prose wi a pickle Scots words tae gie it echt ethneicitie….in ither words YOU, an I mean aw you, ma brither an sister Scots fae Vladivostok* tae Johnny Groats. I want ye aw tae coorie in thegither an be pairt o a Scots commonweel here on Bella Caledonia. Matthew Fitt, Janet Paisley an me want a wheen o ye that are skeely in Scots an fowk that’s never scrievit ocht in the leid, tae gie it a try. It can be quite a leiberatin experience, howkin fae a gowden linguistic seam at’s bidit unwrocht for years, but is a gleg pairt o yer consciousness. Ye micht for ensample be ane o the hunners o thoosans o fowk wi a guid Scots tongue in yer heid, but are unawaur ye hae ane! For Scots is that sib tae English, that monie fowk hae it an dinnae realise it. MAÎTRE DE PHILOSOPHIE.- Non, Monsieur: tout ce qui n’est point prose, est vers; et tout ce qui n’est point vers, est prose. MONSIEUR JOURDAIN.- Et comme l’on parle, qu’est-ce que c’est donc que cela? MONSIEUR JOURDAIN.- Quoi? Quand je dis: “Nicole, apportez-moi mes pantoufles, et me donnez mon bonnet de nuit” c’est de la prose? MONSIEUR JOURDAIN.- Par ma foi, il y a plus de quarante ans que je dis de la prose, sans que j’en susse rien; et je vous suis le plus obligé du monde, de m’avoir appris cela. PHILOSOPHY MAISTER: Naw, Sur, awthin that’s no prose is verse, an awthin that’s no verse, is prose. JOURDAIN: An, whan we’re jist talkin, whit’s thon? JOURDAIN: Awa wi ye! Sae when I say “Nicole, bring me ma baffies and rax me ower my nicht cap”, I’m talkin prose? JOURDAIN : Faith, that’s mair nor 40 year I hae been talkin prose withoot kennin a haet aboot it; I’m muckle obleiged tae ye, Sur, for haein taucht me that. Maister Jourdain jalouses wi the force o revelation that he’s been speakin prose aw his days withoot realisin whit a gleg an clever chield he is! For a wheen Scots, kennin they are heirs tae a glitterin leiterary an linguistic heritage cuid hae the same life-enhancin revelatory pouers… wioot the eidiocy! Ane o the maist hert warmin sides o ma wark promotin Scots ower the years haes been the nummer o fowk fae ma generation that’s come up tae me at gaitherins tae tell me whit a meikle difference tae their ain self regaird they hed experienced readin Scots The Mither Tongue – for maist o thaim it wes the furst an anely time they haed this crucial pairt o wha they were explainit, validatit an heizit up. Dumbfounerin though it is, maist Scots haenae been educatit in their kintrae’s leids, leiterature an historie sae whit shuid be normal an pairt o oor national culture still haes a lang gait tae gang afore normalicy is achievit. Bella Caledonia’s Scots neuk shuid be pairt o the process. Senn us airticles in Scots – they can be in a staundart leid or shaw variations fae aw the airts o the kintrae. We’ll no prescribe, unless ye speir at us for a bittie help. We’re eident tae kythe the virr that’s in Scots on ilkie subjeck – ye can scrieve anent Scots, anent its relationship wi ither leids native an fremmit, anent traivel, politicks, poesie, historie, humour, leiterature, identity, the land, the fowk, the wather! Scots is a leivin craitur, an like aw leivin things needs tae be cherished an loed an nurtured an encouraged tae growe strang an flouer brawly weel. Nae harder job tae mortals hes been gien. Luik forrit tae hearin fae ye, an haein a glisk at yer contributions in the neist twa three months. As wi Gaelic an aw the lesser yaised leids o the warld, Scots maun be yaised ilkie day as a raucle spoken an scrievit leid. Tak tent or it’s tint. “Ultimately, it will also demand changes in you my brither an sister Scots! Oral retentiveness leads to strange and unhealthy complexes and fixations. Go on, break every grammatical rule in your mental straight-jacket and sing out “A’m urnae like that – for gin I’m no pairt o the solution, I’m pairt o the problem”. Liberating, is’nt it? All you middle aged and now middle class folk who once were patted on the heid by teachers and mammies as you divested yourself of your local dialect in order to get on in life, and now find it difficult and artificial to go back – regress now! regain your lost heritage! – knit thy divided self back thegither again. Efter a while, ye’ll no notice the jeyn. Mammies that checked their weans wi thon war cry in appalling English “Talk proper!” Stop it. As far as the bairns gettin on is concerned, the future is Scottish. Speakers of Received Pronunciation – dinnae be feart, there will aye be a wee totie establishment for ye ti belang tae gin ye finnd it necessair. But fredome is a nobill thing, cut your crystall vowels first with safe words like kenspeckle and clanjamfry before walking on the wild side with swally, chib, gadgie and likesae! This inclusiveness will also need to extend to the highly effective Gaelic lobby. Aince upon a time, we were aw suppressed minorities thegither and supported ane anither, but since you climbed a bittie higher, I fear yer leaders hae kicked the ladder awa. When they speak of Scotland as a bi-lingual country, they mean Gaelic and English an deil tak the hindmaist – Scots bein by far the hindmaist in the linguistic pecking order. Jeyn the process of liberation, o Gaels! All the estimated 1.5 million Scots speakers seek is parity with you 60,000 Gaelic speakers. Jeyn us, all you have to lose is your monopoly of ethnic Scottishness in our media, and a few suits! The present’s theirs, but a’ the past and future’s oors. Mair on Billy’s wark here. Here a wee wurd fae London. It’s great tae read in ma mither tongue. Not that Ah ever reely got tae speak it. Ma granny musta pit it up on the heichhumrae oot o sight. Bit a remember Glesca weel an its sair missed doon here. Cannae unnerstan yon Scots guvermint ignorin wir dominant Scots tongue and promotin jist Gaelic an ‘BBC’ English – is that no discriminashun agin us Scots? Ye’d think SNP wid be fir wir Scots tongue? Ye’d think yon wifie Hyslop wid be promotin Scots kultur, naw she’s no. I’m not going to try to write this in Doric (I would hope someday I could). But I wanted to say that this initiative couldn’t come soon enough. In my lifetime I’ve seen a massive decline in Doric in the North East. Having lived all over I’m now living now in Aberdeen and I notice that it is only those over 70 feel comfortable speaking Doric in public. In Peterhead, where I come from, it’s slightly different because many of my relatives of all ages in Peterhead will text in the modern idiom of Doric. Probably the majority of those over thirty in Aberdeen can still speak it, but I’d be surmised if they’re using it at home, so their kids have lost it. It’s reassuring to read that people said it was dying out in Burns day (though I suspect those giving Burns advice would have been from a very small section of society). So I can’t help thinking that it’s almost on life support up here in the North East. Gonae try hard to speak it Just love Billy Kay! A luve the airticle, tho, it’s mad me proud tae embrade this leid, an tae speak and scrieve in it mair nor A uisually dae! Bi the wey, A aye thocht ‘gin’ wis pronooncit “Jin”. In Glesgae, we juist uise the Inglis “if”, sae thon’s me learnt something the day! Whit a braw thochtie. Aboot time an a. Masel, A canna unnerstaun hou oor ain fowk’s sae black affrontit wi haein Lallans as wan o oor ain offeecial leeds. Nae ither kintra gies wan o its maist kenspeckle leeds sic a unco grummlin. Mebbe it’s acause o Lallans bein conseedert fur sae lang’s no onything mair nor coorse English. Whitever, A’m unco hertened this wabsteid’s stairtin, an here’s wissin muckle sonse tae it. I hope you get lots of good articles, though one of the barriers might be that, while lots of people were brought up speaking Scots very few, if any, have any experience of writing in it. I was brought up in a rural valley in Co Antrim in N. Ireland where the vast majority of the population would have spoken broad Scots, essentially the dialect of South-West Scotland, though influenced in syntax by Irish and with some Irish loan words. It was liberating and exhilarating for me to write in my native dialect, but at the same time often difficult to replicate the sounds with the right spelling (if there is a right spelling). Interesting to read Billy’s use of the Ayrshire phrase, “ye cannae dae ocht, gin ye’ve nocht tae dae ocht wi.” In North Antrim a similar phrase was legendarily used in exasperation by an ill-equipped farm labourer when he was told off by his employer for not working hard enough, i.e. “hoo can ah dae ocht whun ye hinnae gien mae ocht tae dae ocht wi.” An if ye cannae unnerstan that ye’ll juist hae tae get oot a guid Scots dictionary. It would be a great shame if the remnants of Scots were entirely lost on this side of the Irish sea and an even greater shame if that were to happen in Scotland itself. As an Irish person, living within sight of the Scottish coast, it has an emotional and expressive power, which can never be replicated by Standard English. Muckle thenks for aw the braw comments sae faur. Keep the faith wi the leid – the maist astonishin thing aboot Scots isnae that it’s eroded, but that it tholes an endures at aw, conseiderin aw the pressure against it. Ye can see here it’s still in a wheen o fowk’s herts. Dinnae fash aboot spellin, friens – jist gae for it. A braw article this, Billy, beautifully scrieven and a’. I have already shared it as far and wide as I am able. This is a brilliant initiative by yourself and Bella Caledonia, and you can rest assured that I will be attentively puzzling through each of the articles published in the Scots Stream. Today already, courtesy of your article, I have added a single Scots word to my wee vocabulary: ‘scrieven’. ‘A journey of a thousand miles begins with a single step.’ — submitted by a diaspora Scot (by adoption) in China. What a great article. Brought tears tae ma eyes doon here in the antipodes Australia. I would love to have a go but don’t know where to start. Thanks so much Billy Kay from a wee Glesca soul whose sensibility is always in the land oh ma ancestors those I remember and those ah can only imagine. Although I now speak with an Australian accent, I still think in Doric. James I have lived here in Australia since 1964, and I still have a Glasgow accent. Will never lose it, don’t want to lose it either. I love these writings, however have a slight problem, ah canny read it aw. Ed – a ken Billy disnae want us tae be pernikiti aboot spellin, but shud it no jist be ‘ba’ in the title, like in ‘fitba’. I’d go with you on that Alf. It was a good read from down memory lane, even for someone from the Glasgow area. Ultimately though, the biggest divisors in life and cause of so much angst, are language and religion. There are certain attractive aspects to us all having a crack at Esperanto. Listening to the Scandinavian dramas on BBC you can hear braw, ken, hoose, noo; all words we were told not to use as kids because they were “slang” and not proper English. Braw tae hear a this. Self regard is fit it’s aa aboot ye’re richt eneuch..baith that o people and that o the hail kintry, but maist o aa bairns. Ess twa year I hae hid the privilege o teachin Scots tae secondary scweel bairns fae twal year aal til echteen..an learnin wi them. Aa this thanks tae the campaignin o Billy, Mathew an mony an muckle ithers. We hae an award worth points at lang last, an we’re squeezin aathin oot o it that we possibly can. Fit hae we seen…a boost in self esteem, liberation, fun an a muckle feelin that the wey they spik his value, wirth, can heeze up literacy an mak the bairns feel clivver…an be mair clivver! Here’s tae bairns fa ken their bilingual! Hullo Billy and aw the folks posting. Ahm living ‘erseas the noo bit lang fur ma hame ev’ryday. Ah’ve been playing aboot wi’ writing a Scots story fur wee weans. Ah think its nearly finished and ah’ll be sending it awa’ tae see if any publishers like it. If ah hear any guid news ah’ll let ye aw ken. Ah huv twa wee lassies and need them to keep their accents while wur no’ at hame so ah practise wi’ them, sing tae them and remind them that they are proud Scots weans. It’s too important for aw oor weans tae forget that the vanacular and the cultyur are what makes us wha we ur. I found it easier to read the bit by Mollière than the rest of that pish. There’s a reason why we Standardised English – it makes it easier – everyone can understand everyone else. Do you want to go back to the days when Shakespeare used to spell his name 17 different ways? Thank you for your expressive contribution Iain – it strikes me as very North British. I notice that your regard for the French genius does not extend as far as spelling his name correctly. Aye, its known as cultural oppression. There are many examples, most linked to colonisation. I’d be interested in who you mean by “we”. By “we” I meant all those of us who speak English. This is the most geographically widespread language in the world and is internationally recognised as the most convenient language for business. Companies such as Seimens use it as the official language for all projects. I myself have worked on projects (at ABN AMRO Bank) where English was the official project language. I can assure you that it would not have been considered helpful if I had spoken or written like “Oor Wullie” when there were Russsians, Dutch, Nigerians, Swiss etc trying to understand how to solve problems. At present there are believed to be 2 billion people who speak, or are learning, English. China is expected to become the country with the largest number of English speakers. So it’s a particularly stupid idea to split Scotland off from the rest of the world using an invented “language”. You miss the point and completely exagerate the supposed inconvenience. Many nations use English as their official administrative language, however these nations also ensure, usually through their constitution, that national language(s) is taught, enabling all people to be bi-lingual, or better (e.g. Singapore, where any one of Malay, Mandarin and Tamil is required to be taught, as well as English). In such countries people have become quite used to speaking administrative English at work, and revert to their ‘national’ language at home and in other informal or formal settings as appropriate. In the international shipping business I worked in, I found my ‘Scots’ actually helped me to better understand Dutch and Norwegian colleagues. Colonialists may try to entirely suppress or oppress indigenous language, as has been the case in Scotland, which is clearly discriminatory, but any self-respecting nation will always seek to protect its languages, which live on regardless or despite official diktat – Scots being a fine example. Scotland should do likewise, and we are already ahead of the game with Gaelic but we need to follow on smartly with the more dominant Scots language, which most of us speak but do not know how to write as well as we should, yet that comes quite easily to native speakers. So we’re not a colony. We agreed to form a Union. We also voted in favour of that Union recently. The laws we have in common are by agreement. Nothing is imposed. The law we apply to our people are laws that we are involved in the creation of. Anyway, we have gone off topic a bit. If you read Scots The Mither Tongue, what I propose is bi-lingualism in Scots and English or English and Gaelic…..being bi-lingual means it is a lot easier to become multi-lingual. Apart from Scots, I’ve got English, French, German, Portuguese, some Russian and a totie bit of Gaelic. All of them came comparatively easily to me because I learned that I had to be bi-lingual from a very early age. To describe the linguistic tradition of Dunbar, Burns and MacDiarmid as “pish” and “Oor Wullie” esque reveals a conflicted identity. I am delighted that I can communicate in a world language like English, but that I have access to the cultural wealth of my national language Scots. I don’t see the point in being bilingual in Scots and English because one is just a dialect of the other. It was only in the Highlands that Gaelic was spoken. It was only in the borders that Scots started to separate away from English for a time, before becoming more standardised again. These attempts to make it into a separate language are artificial. For what it’s worth I also don’t agree that Scotland was ever colonised. Ony nation an fowk telt whit tae dae bi anither nation/fowk = colony. Scotland is also described as the ‘strategic’ colony; without it there is no UK. So, all other languages in the world are going to become extinct and English will be the only language spoken ! Awa n biel yer heed! A very narrow minded and imperialistic view of the world. That’s also the argument I heard from teachers at school as to why we no longer speak Scots. Maybe you should stop spelling your name the Gaelic way and revert to anglo/saxon as that’s the future. Braw tae see oor tongue scrieven, aye, n thirs a mony muckle wiy tae it, bein whaur ye hail frae. Ma wee lassie is gitin the Scots leid at schuil the noo n cam tae me aboot it. Her mither culdnae thoal ma brogue as it makit me a “schemey”! Richt noo wee hae bran new CDs in Scots, Violet Jacob SSCD 801 alang wi a host o ither anes like Thrawn Janet by RLS., MacDiarmid, Robert Garioch, Sidney Goodsir Smith an a wheen o ither graet nems i Scots Literatur. So stoorie doun tae http://www.lallans.co.uk an hae a wee luikie, ye’ll fun some braw pressies for Yuletide. I would subsequently spend some years in Europe, the US and finally NZ, being constantly amazed at the varied verbal variations that that have developed in English (and Scots, Lallans, etc.). It is my contention that a standard phonetic spelling system should be developed, not only to allow better comprehension, but also to make it possible for us to trace meanings as the expressions naturally develop. We lose much when some forms are perceived to be inconsistent and other forms are designated as being proper and traditional. All human expression deserves to be honoured (especially expressions learned in youth!). Udd was a man of Norse origin who in days of yore ventured up the Clyde estuary and eventually settled in an area near Dalmarnock in Glasgow. His little settlement was called Udston, still visible on maps today. Later, his offspring would venture further upstream, past what is now Greyfriars Abbey and onto the last readily navigable part of the Clyde for small craft. Udd’s sons settled in this area and it became known as Uddingston (Township of the sons of Udd). And Uddingston it was for most of it’s life, immersed in agriculture, woolen mills, caramel wafer production and finally coal mining; and it was with the arrival of coal mining that there was a notable change. While those involved in everything other than coal mining still referred to the village as Uddingston, the coal miners referred to the village as “Aidisin”. It was a simple fact of life that most of these men went down the mines from the age of fourteen if not earlier. With their lack of education came what may be one of the causes of much of the divergence we see in language today. It’s worth remembering that at one time Latin was the language of the ruling classes and clerics. What we have in formal English today is a refining of communication from a very broad linguistic palette used by the relatively un-educated; quite a bit of it Scots no doubt. Personally, I would prefer to live in Uddingston, not Aidisin, Milngavie, not Mulgai, Wishaw not Wishi or any other place where we were forward looking. Personally I am inspired and in awe of those Scots educated so highly that they are able not only to speak Scots fluently, but to write it exquisitely as well. Re the “ruling classes”, for some reason they had great difficulty just pronouncing many Scots places and surnames (e.g. Calder) irrespective of the spelling, or the expensive schooling. As they say in Norway, takk for sist! This is a veiled attack on Gaelic. Bilingual is not kicking any ladder away as the English dialects in Scotland function as local forms of English again today, just as they did in the fourteenth century. He tholed supporting the nazis and hopefully would have had less of a problem with a statement on Scots dialects than he had in rolling with fascsm Its up to Scots language campaigners to recreate a separation between English and Scots, as at present, the million and a half speakers of it speak their language as a form of English. Its almost as if they dont want to call English by that name. The old chestnut of Scottish nationalist supporting fascists. In the early ’30’s fascism did not have the meaning it has now – there are photos of Scots Italian families enjoying a day out at “Fascist picnics” in Stirling. Obviously it all changed as the war approached. Would you not be more comfortable in the comments section of The Scotsman? It meant racial nationalism even before the war. keyboard keeps jamming hence the typos. There is no standard way of writing Scots today. This means that in effect, the default shared variety has to be Scottish English or just English. Northumbrian dialects across the North of England dont share a derivaton from Modern English either as is the case too for East Anglian, Midland and West Country dialects and as dialects, they all have equal value as spoken forms of English or “Anglic” and as language varieties in general. The queston occurs, If Scots doesnt have a written form shared between all the dialects, doesnt this mean that today, in effect, Scots is back to what it was in the thirteenth century, ie a group of dialects of English spoken in Scotland that shared more in common with local forms of English in the North of England than they do with Standard English as spoken in the Home Counties etc. Fact: Scots is a language recognised by the Scottish, British and European parliaments. It is an integral part of a great national literary tradition. 1.6 million Scots identify themselves with it. It was the first language I learned at my mother’s knee, before learning English, French, German, Russian and Portuguese. You are welcome to your world picture, but it is so alien from mine that I see little reason to continued communicating with you in this forum. Fareweel. 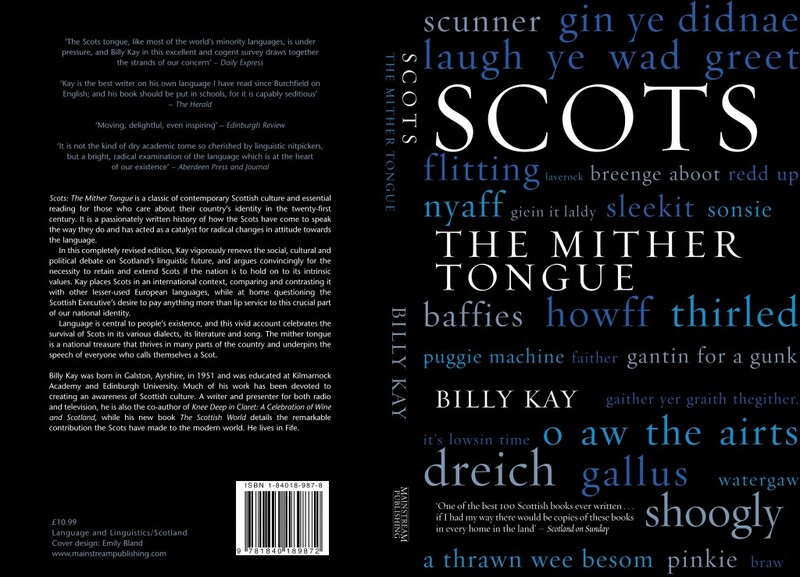 If you would like to educate yourself on the history of Scots, please read Scots The Mither Tongue. Blythe Yule an a Guid New Year tae you an yours when it comes. its a political convenience for all concerned parties and I never said it wasnt a language. Its English and hence a language. He must have been aware by then what he was supporting.